We had friends over for dinner a few weeks back, and it was one of the few days this past summer that actually felt like summer. I wanted to avoid making anything spicy, and decided to try my luck with a dish that I enjoyed as a kid. 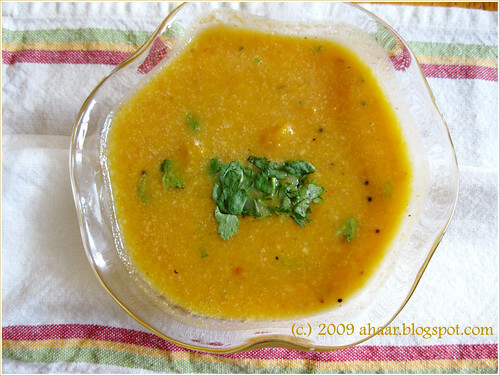 This is another tanjore marathi staple (and I'm sure there are variants out there in Tamil cuisine) typically made with pumpkins, with the milk serving to cut the spice levels. Chop and boil the squash and set it aside. Roast and grind the ingredients. 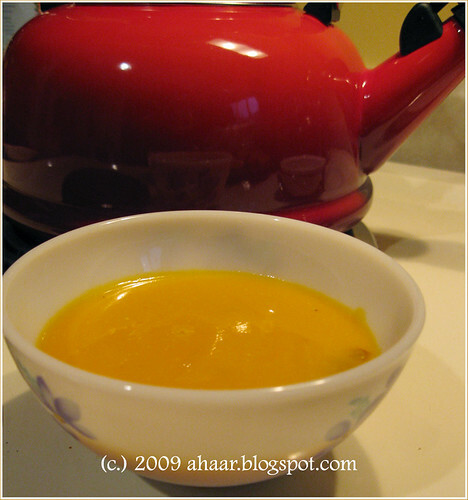 In a thick-bottomed pan, mix the paste with the boiled squash along with some water (as needed). Add salt and let this cook for 8-10 minutes on medium-low heat. Temper with mustard seeds, urad dal, and asafoetida. Take this off the stove and slowly add 1/2 cup of milk (or more if desired) and mix well. Add chopped cilantro and serve with hot rice. 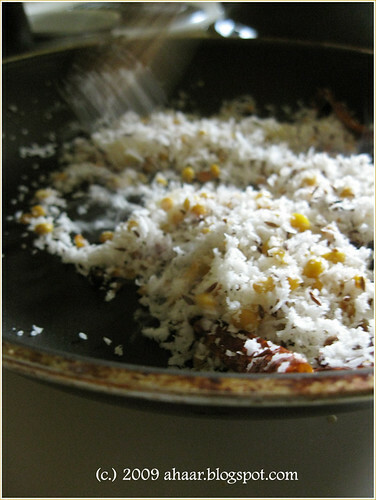 This treasured recipe pic is going to Heirloom:Click hosted by Jai and Bee at Jugalbandi. It's Durga Pujo season! And that means that it doesn't matter how busy I am, I always try to make something sweet during this time. When my parents were here last year, my mom made special meals to celebrate different festivals and painstakingly made narkeler nadu, sandesh and payesh for pujo and Diwali. Even though I wanted to do all that, the busy week left me with little time and energy. But, I had to make something sweet! We had some extra raspberries in the freezer and I combined it with peanut butter to make peanut butter and raspberry muffins. How I came up with the combination? It was what was available at home and just a feeling that this would work. And it tasted great! 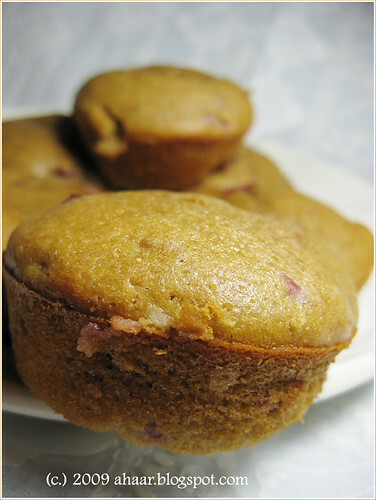 There's the sweetness of the muffins, the tartness of the raspberries and the lingering creaminess of the peanut butter. Mix the sugar and peanut butter together and mix. Then add in the butter and whisk till it's well blended. Add the egg next and whisk. Add buttermilk, vanilla, and lemon juice and mix until it combines smoothly. Combine flour, baking powder, baking soda, and salt in a large bowl, stirring with a whisk. Gently add in the buttermilk mixture and mix till it becomes smooth. Fold in raspberries and let the batter stand for 5-10 minutes. Spoon batter into pre-coated muffin cups. 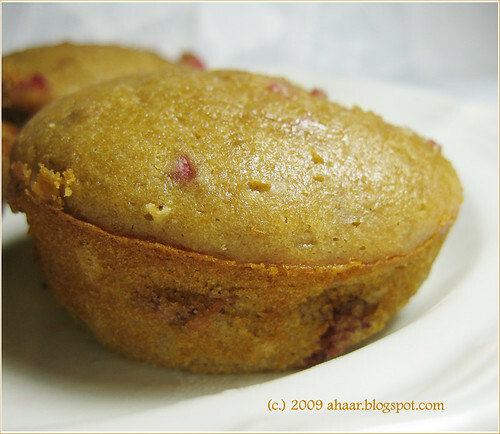 Bake at 375° for 17-18 minutes or until muffins spring back when touched lightly in center. This is another of Madhur Jaffrey's recipe from Quick & Easy Indian Cooking that I made recently with great success. I did make a couple of changes to bring down the heat and marinated the ground chicken for an hour. I don't usually get ground meat. 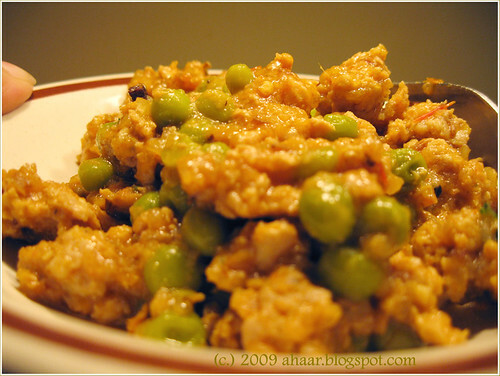 In fact, I've always hesitated about making keema (ground meat) as I don't know the source of my ground meat. But when I was at our Whole Foods, they mentioned that they'll do it using my choice of cuts. That was all I needed to hear. So, I chose a mix of chicken breasts and thighs. 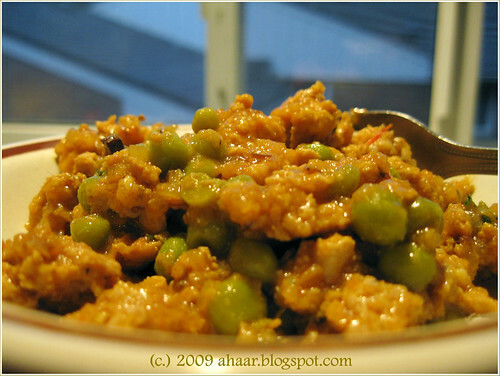 While browsing for recipes, I came across Madhur Jaffrey's recipe and it sounded easy and delicious. So I decided to give it a go. Put onion, ginger, and garlic in food processor for a coarse past. 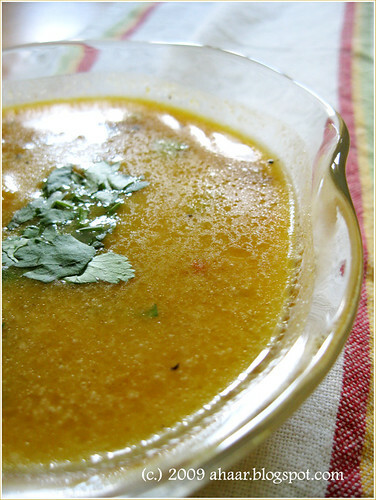 Heat oil in a wide nonstick pan and temper it with cumin seeds, bay leaves and red chillies. Then add in the onion, ginger and garlic mixture. Stir and fry until it is somewhat brown. Then add in red chilli, cumin, coriander and turmeric powder. Stir and mix the spices together. Then add in the tomato and yogurt at low heat and stir. Cook with closed lid until the tomato is soft and it looks like a good gravy. Put in meat, salt and garam masala. Stir, breaking up any lumps, for 2-3 minutes. Then add in 1 cup water stir and bring to low heat. Cover and cook on low heat for 20-25 minutes or until the chicken is almost cooked. Add in lemon juice, and peas. Cover and cook on low heat for another 7-10 minutes. Garnish with cilantro and serve warm. Tastes great with naan, chapati, parathas or rice. It seems like every time I post, I am explaining my long absence. This time I have none. I have lazed around, reading, traveling, making the most of the last few weeks of summer before the semester starts and our life goes back to the busy routine. When I was at my sister-in-law's place, she made this delicious Aamras from Madhur Jaffrey's recipe book "From Curries to Kebabs" and it was absolutely fantastic! We had it with pooris and it made my day. Since then, I have already made it a couple of times for friends and it's been a success each time. When you take the first bite, you taste the sweetness of the mango. Next, you get the tartness of yogurt and then the spices hit you subtly at the base of the throat. It's so delicious you can't wait to take the next bite and taste it all over again! 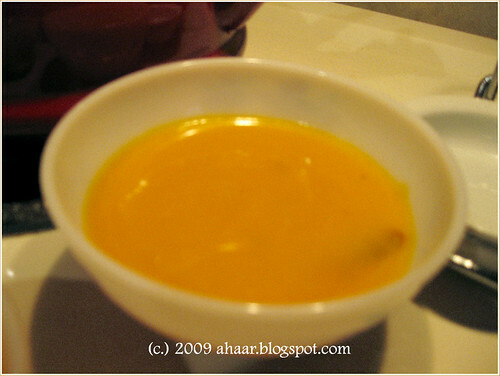 In my preparation, I increased the yogurt to one cup and omitted the curry leaves and green chillies. Mix chickpea flour, turmeric, cumin, and coriander in a medium bowl. Then add very slowly, 1/2 cup of water, mixing with vigorously till there are no lumps left. Add yogurt, mixing it in with a whisk. Pour in the mango pulp and an additional 1-2 cups of water. Add the salt and sugar. Mix well. Heat the oil in a thick, lidded pan and temper it with asafetida first and then, in quick succession, the mustard seeds, the cumin seeds, the chilies, and the fenugreek seeds. Take the pan off the heat. Stir the mango mixture and quickly pour it into the pan. Stir. Put the pan over low heat and simmer over very low heat for 5-6 minutes, stirring regularly with a whisk or spoon as you do so. Take the pan off the heat, cover, and leave for at least 30 minutes to allow the spices to release all their flavors. Strain it through a coarse strainer. Spoon out some of the smaller seeds — the mustard and cumin — from the strainer and stir them back into the soup to add some colorful flecks. Serve it heated or chilled. I have been serving it chilled.